PEDAL PARTIES ARE PERFECT FOR BIRTHDAYS, BACHELOR & BACHELORETTE PARTIES IN HOUSTON! HOP ON OUR BAR ON WHEELS TO DISCOVER THIS AMAZING CITY! Pedal your personal bar around Houston with your friends. Explore the biggest city in Texas on Pedal Saloon’s bike bars. Bring a cooler bag/box, some of your own beer & wine, and lots of friends! Prepare to pedal around the city, touring Houston’s many sights or to just cycle from bar to bar, discovering Houston’s best watering holes. If you find yourself traveling through Michigan, we also have a bike bar in Ann Arbor as well! Pedal party’s are perfect for group celebrations, such as birthdays, bachelor and bachelorette parties. 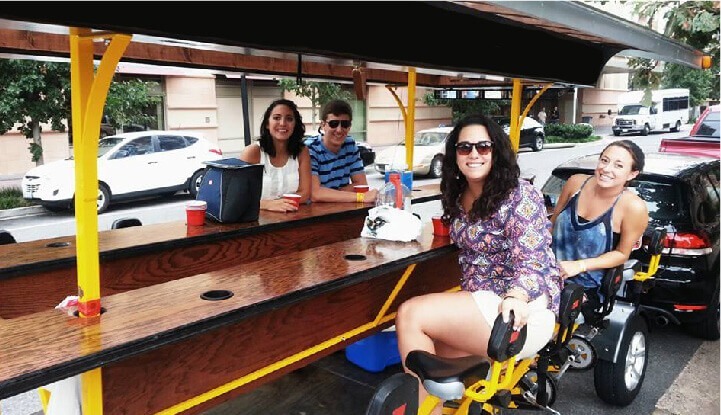 You can even organize your own beer tour of Houston, using one of our bars on wheels to get to each bar without wheels… Share a pedal bike and a drink with new people with a mixer tour. Or book a private vehicle for your private group. Perhaps you could even use our bike bar to plan an elaborate scavenger hunt… Get in touch if you have any questions. Book your Houston bike bar today! Looking for a unique way to explore the city? Pedal Saloon is the answer! 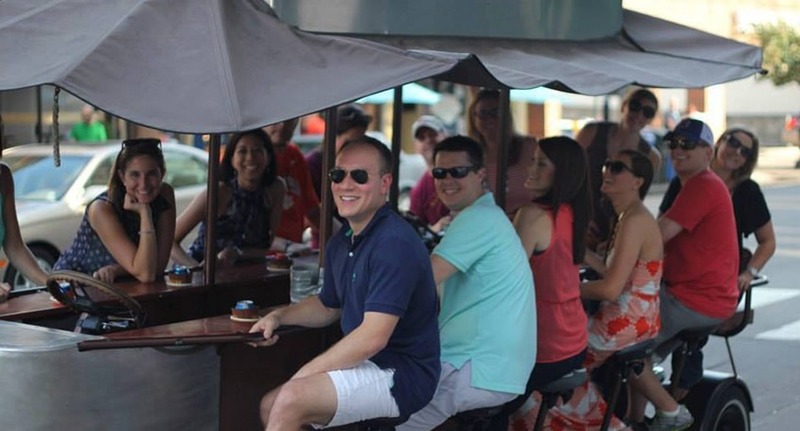 Our bike bars are the best way to meet and share a drink with awesome people! Hop on one of our tours and our guides will show you the coolest places to sip an ice cold drink in Houston! Closed-toe shoes. Cooler bag/box. Your own alcohol, no glass permitted. Impress your friends or colleagues with a drinking experience nobody will forget! Starting at $349, your private party can enjoy the comfort of your personal bike while exploring the best watering holes in Houston. Two hours of guaranteed fun! We work with a handful of local bars, and our deals with them rotate regularly. Call us to find out the latest.